The ‘Settings’ sequence presents a chain of backdrops against which personal events and dramas were played out. Within the dynamic period preceding Seeing Things when Heaney deliberately swooped on anything that stimulated memory or association (DOD 320), he allowed himself to be transported back by the poems that ‘came on’ to the sites, moments and emotions of previous experience, from where he weighed up what ‘in time … was extra, unforeseen and free’ (Markings I). Behind every picture lurks a story. On tour the poet stands at a picture post-card site in Central Moscow (Red Square) and sifts what he sees against what he ‘knows’ about the Kremlin building: its brick wall ostensibly nothing out of the ordinary (unthreatening in scale) yet over time a symbol of repression – just right for people/ To behave well whether subjected to tyrannical rule (under), incarcerated (inside) or just warned to keep unguarded comments to themselves (outside). The square’s vastness (big cleared space) sets the poet’s head spinning (dizzying); its uneven configuration (heave and sweep of cobbles) acting as a launch-pad (beamed up) into the airborne world he once shared with the legendary Sweeney (my dream of flying) over Ireland’s old cart road and his accompanying bird-like feelings of release and loftiness (all the air/ Fanning off beneath my neck and breastbone). Heaney’s allusion to the Irish king exiled by a repressive church extends to a distinguished Russian literary figure who faced up to a tyrant and got away with his life: The cloud-roamer, was it, Stalin called Pasternak? 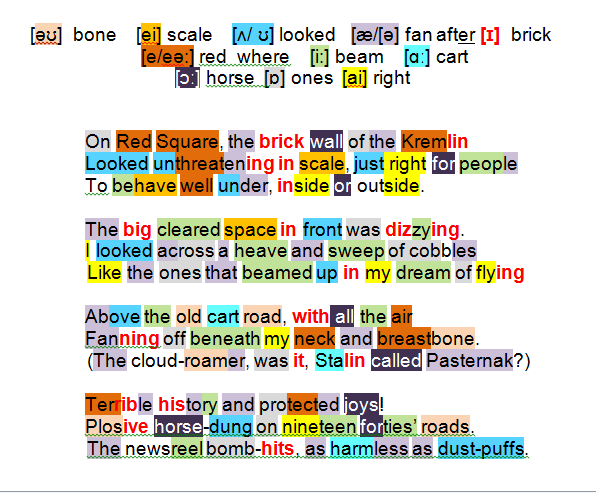 So, what has this scene from Russia’s terrible history unearthed in Heaney? Footage of improvised ’dirty’ devices of World War II (Plosive horse-dung on 1940s’ roads)? Or memory a non-conformist Pasternak safeguarding priceless written word and refusing to incriminate his fellows (protected joys) from tyrannical threats (newsreel bomb-hits) that failed to quell the creative spirit (as harmless as dust-puffs)? Heaney visited Moscow with his wife in 1985 (hosted by Yevgeny Yevtushenko); this included a visit to the literary complex at Peredelkino where Pasternak took refuge from the mainstream and where he is buried; see also In Search of Rain in Part I.